Manmohini Events is delighted to present The PRIDE of India and the BBC Award Winner Ms. Kaushiki Chakraborty to Melbourne. Kaushiki Chakraborty is a RENOWNED Indian classical vocalist and the daughter of Ajoy Chakraborty. She is from a well known musical family of Calcutta. Groomed at Sangeet Research Academy where her father was teacher, her singing repertoire covers Khayals and Thumris, which in Hindustani music are ‘semi-classical’ or ‘light classical’ styles. She has been recipient of many national and international awards such as the BBC award in 2005, and has performed with elan at many national and international festivals and conferences.She belongs to the Patiala Gharana. She has held performances with her husband Parthasarathi Desikan in the United States. Chakraborty has participated in many major concerts. Apart from rendering Khyals in her performances she has also occasionally adopted contemporary form of Indian pop music. She performed at the Dover Lane Music Conference from the age of 20 and continued participating for the next 5 years. In her recitals she presents a mature and often with rhythmical swing succeeded by unrestrained taans in three and-a-half octaves. Premier Tickets Australia is proud to be the online ticketing partner for Kaushiki Chakraborty Live in Concert 14th April 2018 at the George Wood Performing Arts Centre . Please contact Manmohini Events for any information about concert. Premier Tickets is an online event marketing and ticketing agency. 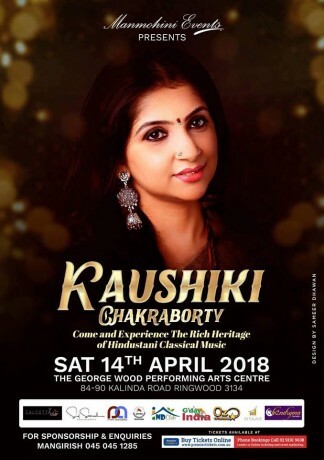 Premier Tickets will NOT be responsible for any changes related to the event schedule, artist, venue or cancellation and refunds related to the tickets for Kaushiki Chakraborty Live in Concert. Manmohini Events reserves the right to update the Disclaimer and Terms and Conditions without prior notice. For any reason outside the control of Manmohini Events, if the event is cancelled, Manmohini Events wont be held responsible from and against any and all costs, damages, fines and expenses incurred in the process of attending the event.